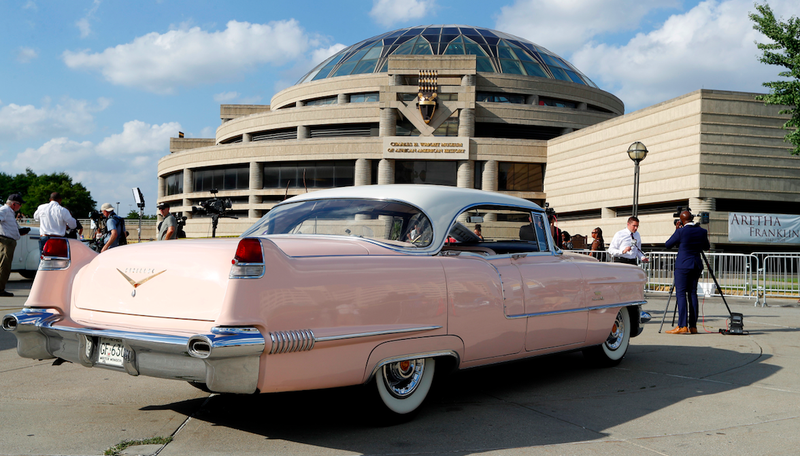 “We goin’ ridin’ on the freeway of love in my pink Cadillac,” the Queen of Soul, Aretha Franklin, sang in her hit 1985 song “Freeway of Love.” So it’s only fitting that over 100 Cadillacs are lining up right now, just outside of her funeral in Detroit on Friday, NPR reports. And it’s not just old-school Cadillacs slated to show up, either. A pink Cadillac Escalade owned by Crisette Ellis will be there, too. Ellis is a sales director for cosmetics company Mary Kay, renowned for giving its best sales consultants pink Cadillacs for their hard work. Franklin was born in Memphis but raised in Detroit from an early age, and got her start gospel at the city’s New Bethel Baptist Church. She went on to become one of the most famous musicians of all time—according to Rolling Stone, the greatest singer ever—and an icon of Detroit itself. It’s only fitting the Motor City turns out in force to see her off. She died earlier this month in Detroit at age 76. Approximately 130 Cadillacs, per a count issued Thursday, are set to stretch down the street in front of the Greater Grace Temple for today’s services. May most of them be Coupe DeVilles, Calais, and Eldorados and not Cateras.